I can't sleep tonight, so I guess I will write for a while! I grew up on the Long Beach Peninsula in Southwest Washington. Although it's a peninsula, there is water on all 4 sides, the Pacific Ocean to the West, the Columbia River to the South and the Willapa bay to the North and East. The South East corner is just barely attached to the rest of Washington state. Water was everywhere, and a majority of the local industries depended on it. 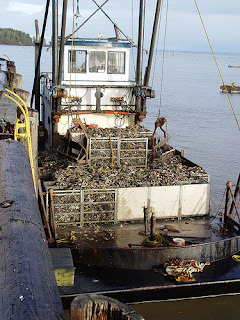 Fishing, crabbing and oysters were (and probably still are) some of the major industries. With water being everywhere, many families had boats, whethere it was for work or recreational use. Until I left the area I didn't know how lucky I was. As an adolescent we were always out in the bay. We would go out in kayaks (without adult supervision or life jackets! can you imagine?). If you have a boat, or are looking for marine insurance go check out boat insurance from CoverMyBoat.